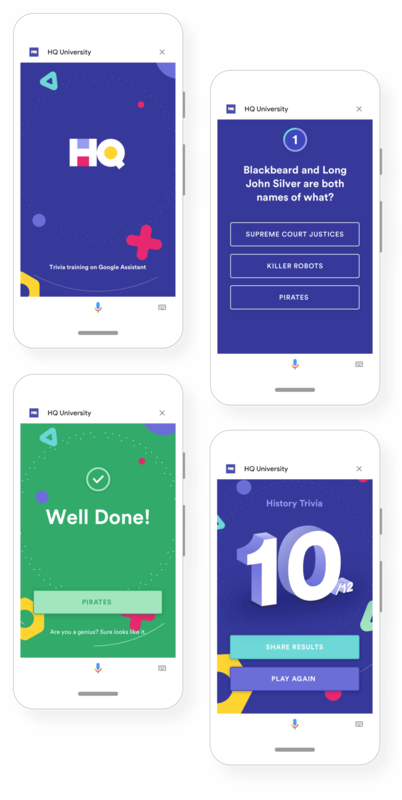 In col­lab­o­ra­tion with the Actions on Google Team and HQ Trivia, we set out to create a voice-first trivia game for Google Home and Assistant. The game’s host, Scott Rogowsky, and his A.I. 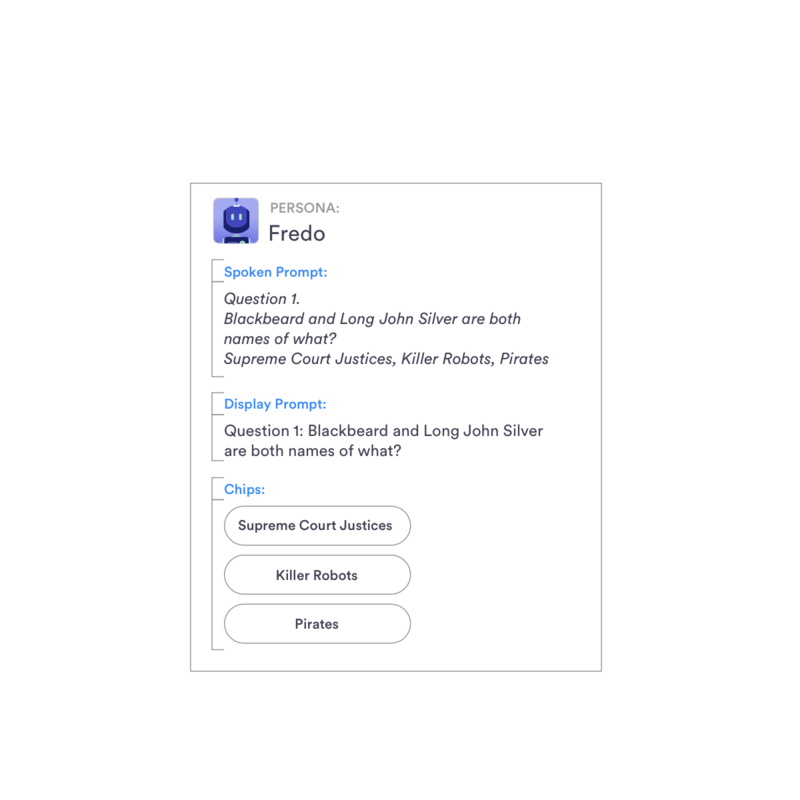 Teacher’s Assistant Fredo serve up games of 12 questions that get more challenging as they go. Players are invited to play via noti­fi­ca­tions on their phone, and can play with any Google Home device or the Google Assistant app on their phone. Users of Smart Displays or Android phones are delivered an interactive visual interface for the game that also enables touch interaction. Using the admin we built, HQ can schedule themed days (history, music), and manage questions to keep the game interesting over time. Our guiding principle in the con­ver­sa­tion design of HQ University was to stay voice-first. All elements of game play should be able to work with your eyes closed, sound off, through a chat interface or with the touch interface delivered through Google’s Canvas technology. Dialogue is at the core of a conversation design project. Like a choose your own adventure, we started by writing variations on the dialog flow that are influenced by a variety of user inputs. Our team defined the roles of the host (Scott), teacher’s assistant (Fredo), and the player clearly so that the exchange between them could feel more natural and engaging. We ran it through its paces by reading it aloud as a team. Once we had a working prototype of the voice interface, we began playing the game to get a feeling for the variety of ways a user might engage. When asked a question, will the user say ​“the middle one” instead of the answer? 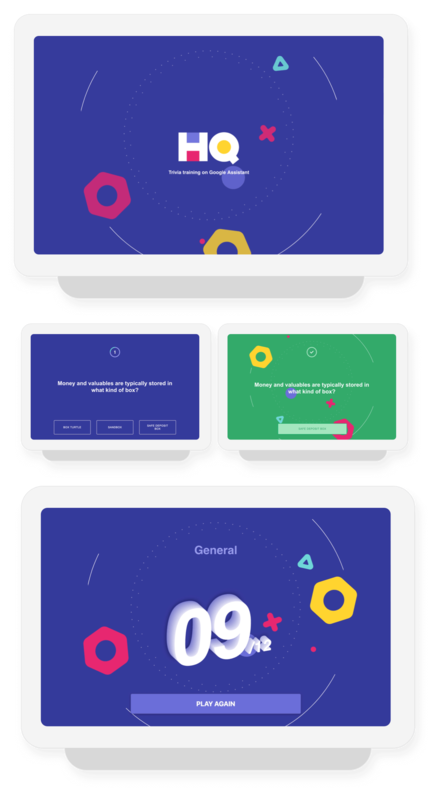 As the dialog began to solidify, we began a process of wireframing and creating a user interface for smart displays and Android phones that aligned with the dialog. This way a player could engage with it passively or actively throughout a game. All visual elements and inter­ac­tions to be should be added fun, but not a required part of the game experience. Players can engage with the game from wherever they are on any smartphone that supports Google Assistant. Individuals with Android phones will get an additive visual experience with a touch interface that brings the game to life in a new way. Each experience ends with a shareable social card that allows users to post their score. Players with a smart display will experience a fully interactive trivia game brought to you by Scott and Fredo. Fun animations and touch inter­ac­tions add an immersive feel to the voice component of the action. Hey Google. Train me up for HQ Trivia.